I have wonderful news on the thyroid results of my retest (after I cut the dosage in half and threw it out of wack). It seemed I was a bit too enthusiastic believing it had partially healed. I began to wonder so I went for test results and reported on them in the previous newsletter. They were the worst results I'd ever had! So the devil had me doubting I'd heard from the Holy Spirit at all and I repented for not getting a blood test and letting the doctor reduce my dosage or eliminate it entirely. I still believed it was healed but just not shaping up in the physical realm yet. The doctor at the clinic where I go for blood work only increased my dosage by a 1/2 tablet (which made it a total of 1-1/2 tablets) even though I was previously on 2 tablets. I felt like this was going to be a long process since I figured I'd have to go back to 2 tablets to bring it back to where I was, so I wasn't so happy about having to retest in 6 weeks, then go up to 2 tablets and retest again. I'm not at all fond of clinical environments or needles, but I always pray myself up on peace Scriptures so I can be calm and relaxed. At this point you can just shout to me, "Oh ye of little faith." And in this situation I was definitely there. Last Wednesday I went in to get the blood test and awaited the phone call to tell me to increase it to 2 tablets. I didn't even let the nurse tell me the results before saying, "I'm going to have to go back to 2 tablets, right?" She said, "No!" It was within the normal range, so I was good. WOW! That huge span must be God! I shouted while still on the phone! But didn't have my Hallelujah Dance and Victory Party until my husband heard me and joined the joy wagon. Not having to go back to 2 tablets means MY THYROID IS HEALING! Actually it's being totally restored since it was zapped with radioactive iodine in 1976 and was destroyed. I'm not due for another exam until May, but if I get any sense of it being hyper, I'll go for a blood test. This has been a great encouragement to me on my healing journey. No matter what we see in the physical realm it doesn't make it so in the spiritual realm. When we renew our minds enough to bring the healing Jesus gave us with His stripes, we will see it all in the physical realm. 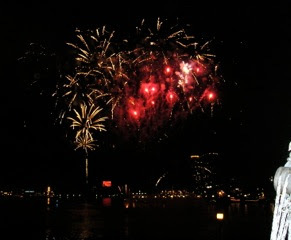 I have a lot of renewing to do, but it's so wonderful to have the senses be able to see something happening. Seeing the results of it during this healing journey has been an awesome experience, but not without challenges for sure. The devil is continually in my head telling me lies about my awesome Father and Jesus, but I've got the Word and that is the Truth I live by. I don't go with what I see or feel. The Word is True and that's where my mind, head and heart remains. It's not a cake walk, but the results are worth it. I just keep reminding myself that the only other option is to give up the spiritual battle and lay down waiting to die. Not that Heaven won't be a grand place to go and be, but I don't want to enter my welcome party earlier than my Father has scheduled it for me. So, I decided that, "I shall not die, but live, and declare the works of the LORD (Psalm 118:17). Our most exciting event for November was mating Buck Moths. My sweet husband was outside one day (November 10) doing some chores and noticed a bunch of flying critters that seemed to be in a frenzy. He called to me to bring the camera and take a look. I took pictures from afar and then realizing that I wasn't deterring the flying mass at all in being there, I got down on the ground and got some closeup photos. What an unusual critter. It looked like a bristled caterpillar that had sprouted wings. I'd never seen anything like it. Kinda like it kept it's caterpillar body but grew moth wings. I was definitely fascinated, especially with the beautiful colors. Even in the air you could see the bright red like a flashlight and the white of the wings. Finding that there were two of these, not just one that I thought was dead, made me realize they were mating. They were attached and all the other frenzied moths were responding to the pheromones being released from the female. On the video I took you can see how the males were actually attacking the mating male or maybe just wanting to share the event. They were making some kind of clicking noise also. View the video of the swarming Buck Moths. I had to post the photo on BugGuide.net to find out what it was. Funny, but the name Buckmoth kept coming to mind, but I had never seen any things like this with these colors and the caterpillar/wings combination, but I checked my photo gallery and found the caterpillars that had been identified as Buck Moths and they seemed nothing like these, so I ignored the prompt. But when it was ID'd that's what it was. I was told there is great variation amongst this species. 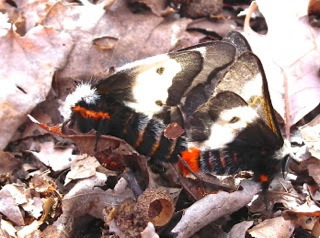 To see an example of the variation, view a Buck Moth Caterpillar photographed in June 2009 on our property. And another Buck Moth Caterpillar in June 2011. Seems June is the month larva month for them in our habitat. The Buck Moth (Hemileuca Maia) is a diurnal moth (flies day and night) that emerges in late fall or early winter. Their host plants for the caterpillars are a variety of oaks, which makes sense, since we have quite a large number of oak species in our back woods. The story goes that the Buck Moth emerges in the morning, mates in the early afternoon (this was before 3:00 PM) and lays her eggs in the late afternoon in rings around the twigs of the host plant (oak trees). The female is on the left in this photo since in this species, the female is larger than the male. I wonder if she was smiling at having so many admirers. I couldn't resist taking a couple of videos of wrens bathing in a thin layer of water that was on the glass-topped coffee table that is on our deck. They looked so funny when they got soaked down, but it was amazing they could get that much water into their feathers just by belly rolling on the glass. One wren began the show and then after it was finished, another flew in and the first one came back. How adorable. I love wrens. They are such cheery birds, singing all year long. View Video One. View Video Two. The front porch bird buffet has been a huge success. This year I decided to hang everything and not have the table to keep clean. 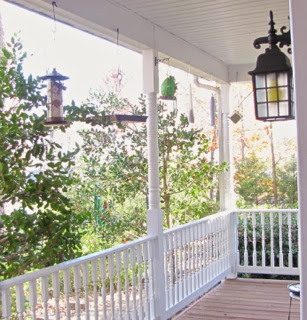 However, it's harder to get photos since the camera picks up the light from outside the covered porch and whatever is on the porch isn't as well seen. It's still been great fun to get to see the show. The birds are in and out and all about all day long. View Video of Bird Buffet. And then there is the Pileated Woodpecker who visited the suet feeder hanging at the corner of the porch. They are huge birds and he kept swinging around and chattering a bit, but sure enjoyed that suet. They've been coming for years to the Front Porch Bird Buffet so I often wonder if it's the same ones. These birds live from 9 to 13 years. That's a long time. We sure do appreciate all our species of woodpeckers here in our wooded habitat. They keep our trees alive eating all the bugs that try to get in them for a meal. View Video of Pileated Woodpecker on Porch Feeder. 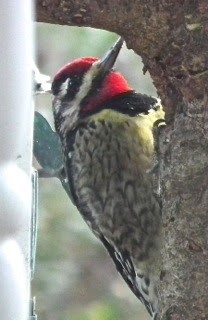 We only see the Yellow-bellied Sapsucker in winter and we're not real happy about that since he seems to enjoy the sap from our holly trees. We thought they were bushes when we planted them, but they turned out to be trees. In our Central Virginia area the Sapsuckers arrive in mid-November and stay for the winter. This male's contrasting soft yellow breast with such bright coloring on the head and throat makes him stand out on any tree, but he seems to prefer the two hollies that are in front of the porch rail. He has also killed one of our pyracantha (Firethorn) bushes by girdling the trunk. They tap little holes around the trunk for the sap to drain (that's why they're called sap suckers) and that's not good for the plant. We love the immense amount of activity they get with the multitudes of berries. 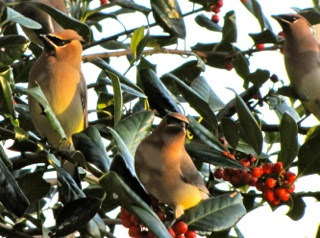 We see the Cedar Waxwings in January through March. They must be in some sort of a migration then because flocks will arrive all at once and then they'll be gone after a few days. I think they are the most elegant birds. It looks like they've been to the designer studio for one of those magical makeovers, but it's just another example of God's incredible creativity and love of beauty. We are so blessed to be in a world with so much beauty. Yes, man is destroying a lot of it, but we still have a lot of what God made for us to enjoy. While our friend Charlie was here in October, he and Randal replaced some boards on the front porch steps and when they took the old ones off, they discovered a huge nest of leaves. Oh, how I wanted to dig through it and find out what was living in it. There was definitely something moving around as I was looking at it because the leaves were moving, so I figured it was a nocturnal animal since they sleep during the day. 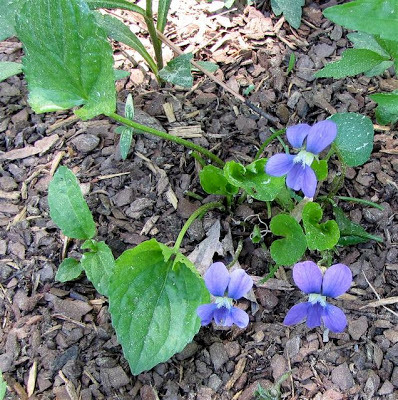 I would love to know what it is, but it's just nice to know we're providing refuge for something. We purposely didn't enclose the open area under the front porch so things could have a place to hide or sleep. We blow leaves back in there each year to keep it cozy. Anybody ever have this happen at your place? Looked liked squirrel work, but I don't think they would nest under a porch and they wouldn't be sleeping during the day. 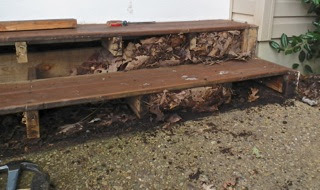 It's a perfect place for mice, since I put ground food under the other end of the porch, so the birds, squirrels, etc. can get to it but the deer can't. This would be an awfully extravagant mouse nest for sure and I didn't see the typical variety of chewed up things that I've seen in mouse nests in our garage, but then they wouldn't had access to the variety of stuff stored in our garage. Any ideas? We purchased this in February and put her in it but she wasn't fond of it. Seemed to be uncomfortable with it since it didn't have a solid base to remain stable. She loves to lay on brown shipping paper, so I decided to put some of it in the snuggle basket and a day later she climbed in. She looks really happy with it now, only nine months later. 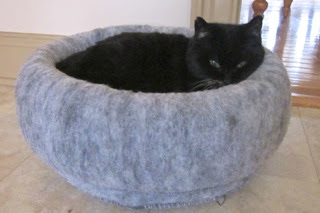 Now she has a choice of three baskets around the house and since she turned 16 back in July, she's been allowed on our bed during the day. Before it was only to sleep at night, a rule that she did obey, so I guess it's a reward for being a good girl. At 16, it was a better deal than having to buy a car like a child wants when they turn 16. For an FIV kitty, she's been a real sweetheart and we're grateful for every year we have her. 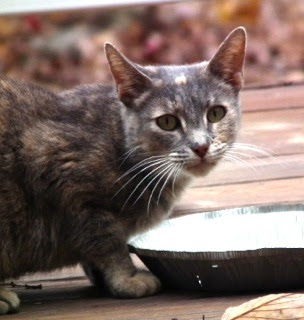 The stray cat we've had coming around is still without a home. The temperatures have been in low 20's already some nights, so if you would send up another prayer for a home for her, it would be a blessing. I am feeding her now and praying over her each day for protection and warmth. She has such a beautiful face and I love the coloring. May you have a peaceful month of December remembering that Jesus came so we could have peace and joy and a Savior to give us eternal life. Don't make Christmas a blur by focusing on stuff or even holiday goodies. It's a time to show His love to those around us in simple acts of kindness. Seems rather silly to give gifts to those who have so much when there are so many barely have anything. That's where our time and gifts need to be given. P.S. Know somebody who needs to see something in this newsletter? Send them the link to the website: www.TheNatureInUs.com. 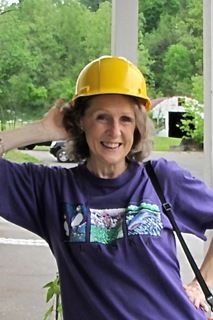 This was one of my celebratory excursions with a friend as I was healing from the heart issues. You can see I was thrilled to be outside and "in action." My Thyroid Isn't Healed Yet (DLW) - This Has Been Updated! The photo(s) and article are copyrighted. You may use either of them if you include the following credit and active link back to this website: © 2012 Donna L. Watkins - This article was reprinted with permission from TheNatureInUs.com. 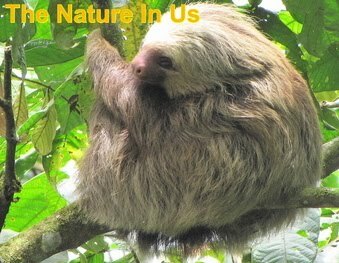 The link to use is: www.TheNatureInUs.com.